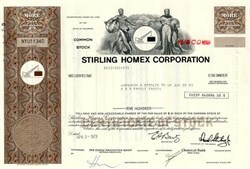 Beautifully engraved uncancelled certificate from the Stirling Homex Corporation issued in 1973. This historic document was printed by the Security-Colombian Banknote Company and has a block border with a vignette of an allegorical woman holding a globe and an allegorical man with the image of a crane between them. This item has the printed signatures of the Company's Chairman of the Board ( David Stirling, Jr. ) and Secretary and is over 31 years old. The Stirling Homex Corporation planned to manufacture and install modular housing units across the nation. In early 1970, Stirling Homex took their company public. Within a couple of years, it was determined it was all a fraud.